I can still remember how my mind was completely blown away the first time I saw The Sixth Sense. Of course, the “twist ending” isn’t anything new to cinema - Psycho, Scream, and The Usual Suspects immediately come to mind. But what I found so impressive with The Sixth Sense was how the twist was hiding in plain sight the entire time. Future viewings only made me feel stupid that I didn’t figure it out the first time. In hindsight it seemed so obvious. Then came Unbreakable. It was at that moment I became a forever fan of M. Night Shyamalan. Yes, he’s stumbled, even occasionally falling straight on his face - I’m looking at you The Happening and After Earth. But through it all, I’ve been happy to give him my money. Finally, I feel like with the release of The Visit, M. Night is slowly returning back to the quality storytelling that attracted me to his movies in the first place. So when I was finally able to curl into bed to watch Split, expectations were tempered, but hopeful. That evening I selected some Purple Cadillac to enjoy before the feature presentation. Purple Cadillac is an indica that’s crossed between Blackberry Kush, The Black and Purple Urkle. For having purple right in its name, I was surprised how little of that color was actually present in the flower. That said, nugs are rather dense, mostly deep green in color with orange hairs and generously sprinkled crystals. The aroma is mild and sweet, not overly pungent or dank. As for flavor, this is a tasty one to boot. It starts off with a pleasant earthiness before mellowing into a subtle grape flavor. I sparked up a bowl, excited for my evening of terror to begin. I had expected to start feeling some effects kick in by the time I started the movie, but nothing. This Purple Cadillac had a decent THC percentage of 19% so I told myself that I just needed to be patient. 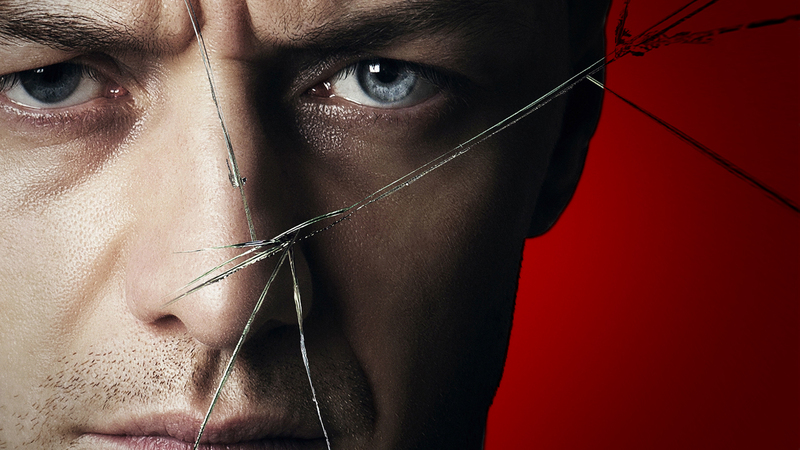 Split stars James McAvoy as Kevin, a deranged kidnapper suffering from multiple personality disorder - two dozen personalities to be exact! Right away, similarities with Orphan Black came to mind. If you haven’t seen that BBC show, it’s about multiple identical women with vastly different lives and personalities all played by one actress, the supremely talented Tatiana Maslany. Watching Tatiana portray all these women is a spectacle to behold, and watching James is equally as impressive. The movie also features Haley Lu Richardson (Claire), Jessica Sula (Marcia) and Anya Taylor-Joy (Casey) as three high school friends - although it’s obvious right away that Casey is the odd-girl-out, only being allowed to hang with the other two out of pity. The opening scene begins with the girls wrapping up a birthday party and making their way back to Claire’s dad’s car where he’s waiting to take them home. As they pile into the car, they’re startled when they see that the person in the driver’s seat is not Claire's dad but Kevin. After an unsuccessful attempt to escape, Kevin quickly chloroforms the girls and kidnaps them back to his underground hideaway. Oh, and did I mention that the girls are meant be offered to 'The Beast' as a sacrifice? Yup, there's that. At this point in the movie, I started to feel some subtle effects of the Purple Cadillac beginning to take hold. I still had my wits, but my body fell into a comfortable state of relaxation. I wasn’t couch-locked, just nice and relaxed. My lower-back pain melted away and I felt good. Truth be told, I prefer when there’s a nice cerebral high mixed in, but this wasn’t bad. I guess the good news is if someone walked in or called me on the phone I still would’ve been able to hold a coherent conversation. Split really begins to open up (see what I did there?) once the girls discover that Kevin suffers from multiple personalities. But it’s more than just personalities. He’s able to manifest physical attributes for each unique personality - actually contorting and changing his body. Sometimes he presents himself as “Ms. Patricia” a stiff no-nonsense woman, or “Barry” a flamboyant fashionista. But the personality that proves to be the girl’s only chance of escape comes in the form of a 9-year-old boy named “Hedwig”. The most terrifying personality, however, is introduced during a session with Kevin’s therapist, Dr. Fletcher (Betty Buckley). It’s during this session that we learn of “The Beast” - a personality that has always remained suppressed. Oh, and did I mention that the girls are meant be offered to "The Beast" as a sacrifice? Yup, there's that. From here it’s a series of shocking moments and great performances from the cast that take us to a climactic third act. I won’t get into any spoilers, but I will say that the ending is extremely satisfying and the payoff is worth the ride. There’s also that trademark Shyamalan twist which I won’t ruin here. This movie made me happy. Split is a well-crafted horror movie with brilliant performances from Anya Taylor-Joy and especially James McAvoy. If it weren’t for McAvoy’s commitment to each of the characters he plays, this movie could’ve ended up a cheesy and unconvincing. But McAvoy absolutely crushes it. So is this a good movie to watch high? I suppose. Although I felt totally lucid the entire time while "under the influence" of Purple Cadillac. Fortunately, the quality of the movie more than made up for the somewhat disappointing effects of my bud that evening. Thanks for checking out Bloody High. Please leave a comment below if you've watched Split or have tried Purple Cadillac. And please don't forget to follow Bloody High on Instagram, Twitter and Facebook.